Is there a plugin or a means to weight a shaped blend to certain predetermined points instead of the normal center of the shape? 2) Use Curves (or, in the simpler cases, Levels) to map to another gradient. In other words, you can see the initial gradient as indicating how far you are from the border, and the Curves as mapping that distance from the border in to a grey level. Thanks for the help, but that will not work. I will keep trying to write a script to do the work. Maybe as a starting point for a script. 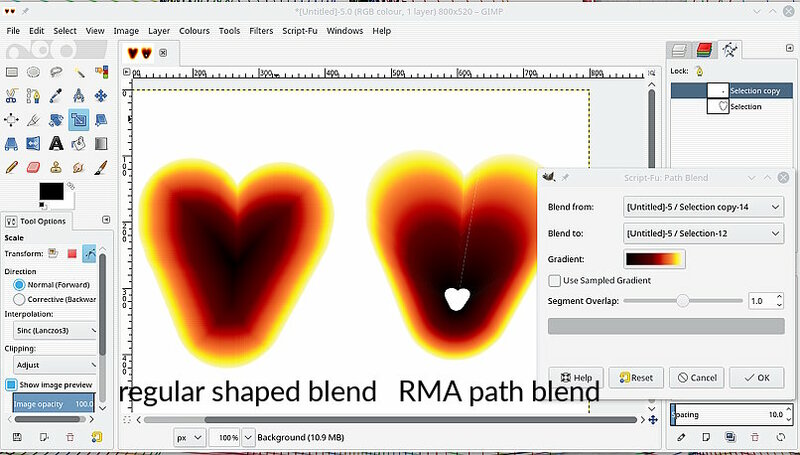 RMA_path_blend.scm Uses two paths and there are snags - the paths must have the same number of nodes + empty space to fill in. (01-06-2019, 03:36 PM)Animusmontus Wrote: Thanks for the help, but that will not work. I will keep trying to write a script to do the work. If its a script, you can replace the Curves by a Gradient map with a gradient created on the fly. Otherwise show an example of what you want to do. I am working on a height map. I have the land roughed in as a flat surface. The sea floor has been roughed in and edited. The mountains were already placed. I wanted a blend to go from the shore pixels to the mountain pixels. Using the builtin blend, the mountains would be surrounded by a hill. And I have recently given up on writing a script so far -- I keep running out of memory and am not sure where or what is eating the memory (16 GB or ram and 2 GB swap). (03-01-2019, 02:16 PM)Animusmontus Wrote: I am working on a height map. I have the land roughed in as a flat surface. The sea floor has been roughed in and edited. The mountains were already placed. I wanted a blend to go from the shore pixels to the mountain pixels. Using the builtin blend, the mountains would be surrounded by a hill. And I have recently given up on writing a script so far -- I keep running out of memory and am not sure where or what is eating the memory (16 GB or ram and 2 GB swap). Perhaps post an example picture? Assuming that you start with the selection already set, it should not be too hard to script if you want many layers.